belong but also due to customs that the community has adopted. functions of the marriage of Iyers. It does not mean that these are same for all Iyers. in practice but Kanya Shulka or brides money was given to the father of the bride. important mantras recited at different times. Marriage is one of the important samskaras in an individual’s life. 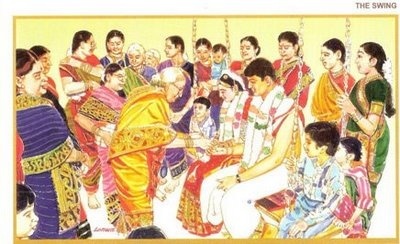 Every individual iyer knows that the iyer marriage is a very complicated function. Hindu community are those rites, which have been prevalent for the past 25 years. 3.Pongi Podal at the aunt’s house. 4.Yatra danam at the Grooms house. 24.Groom leading the bride in front of the fire. the performance of the marriage) was added to this simple function. guests etc form a part of this function. daughter-in –law participates as a Sumangali in this Pooja. are going to form a family themselves. to prevent bad words or words of ill omen from being heard at the marriage hall. Let the path of these elders who are my friends be devoid of stones and thorns. straight one. Let the Deva Aryama help these elders in their endeavor. used to be even on elephants. wear a garland or scents, never wear sandal paste and in fact lead a saintly life. only a cloth up to the knee. Ofcouse now it is not like that. for Vilayadal or playing. This is supposed to be given by the groom’s sister. Sometimes along with this she also presents a silk sari. of the Hindu marriage ceremonies. religious beliefs that he has gained expertise in Vedas by this time. previous night.. This is a purely Loukika custom. fact that he is ready to become a grihastha. informs the bride’s father that he is going to Kasi. become a grihastha. The groom accepts this request. relatives sing various songs in the background. bride during this occasion was supposed to be purchased by her maternal uncle. holding of hand, which is a Vedic ritual takes place much later after the oonchal. directions. This is a ceremony meant to ward off evil from the groom and bride. round the bride and groom and breaks the coconut. The Vedic ceremony of marriage only starts at this juncture. and prays God to help him complete the rituals without any problem. bride’s father whether he agrees to protect the dharma of his family. He agrees. traveler in search of knowledge approaching the bride’s father in a different village. the Aswini Devas with he permission of the Sun God. because the transfer of ownership of the bride is complete. in his home for life. over my feet destroy my enemies and take care of my family. all people love me like this, please make me own several herds of cattle. like qualities. Let all people love me. Please give me cattle wealth. talks to her and requests her to become a part of his family. you to shed tears at this time. She is full of life and is going to lead a happy life. ancestors. Shedding tears now will displease them. “ Hey maid, Please be the one who is not giving a harsh stares at the husband. always keep your body clean. I will be praying for long life for all the children, which you will beget for me. once again to make her behavior kind towards him. This means holy bath and marriage preparations. This is done in a few steps. 1.Prayer to the Brahmins to bring water that is holy for giving bath to the bride. 2.Prayer when keeping the dharbha ring on the head of the girl. relatives to surround him and the bride. 3.Prayer when keeping the yoke on the ring. 5.Prayer for performing holy bath to the bride. let it , Oh maid, remove all your sorrows, and let it also give you eternal pleasure. purest colour, let it give all the pleasures of this world to you, Oh, Maid. rise to the innate principle of the ghee, give you all the pleasures of this world. 6.Prayer while giving new clothes to be worn by the bride. (Sari), Now the groom gives her a new cloth which should be worn by her in future. of other males by bringing her under the protection of marriage. Mangalya means that which gives good things and Dharanam means “wearing”. groom’s father.The shape and content of Mangalya varies from family to family. on the custom of the bridegroom’s family. Veda, It also is important to note that this ritual is not prescribed by the Vedas. has just begun and is far from being over. as toe ring and claim that this was an ancient ritual. Possibly this was worn to identify a married woman in ancient times. parents. It is not clear when the joint family concept came in to India. now giving you to me along with wealth. fortunes in this world. .
Vedic ritual, scholars believe that this should be done during the auspicious time. the life of a householder. given you to me for the purpose of raising my family. blessing. I announce this loudly in front of all so that you will definitely bless me. minute of our future lives. Let Him come with you for a third step to make you observe all religious rituals. “You who has taken the seven steps with me should become my friend. We who have taken the seven steps together would live as friends. I should get your friendship, Oh maid. Oh maid, I should never get parted from your friendship. mind, and should enjoy together the food and all other tastes. We would plan all things that are to be done in future together. Let us both make our two minds in to one. that she is below him and should obey his wishes). I am telling this because I have lot of care for you. and good luck increase in my family. of her children, God Varuna should agree with Agni to prevent the children’s death. For this purpose I make this offering in the fire. in her lap in the early morning. Savitha and till you wear clothes; Let you be protected by Brihaspathi. birth of a son and those which cause the death of a sin in you are removed from you. God remove all such defects in you and transfer them to your enemies. 13.I am reciting this Vedic prayers and surrender to you so that I can save myself. allotted years from my life. happy when we call you. my mind and beg to get your blessings. capacity to demit our sins. Mangalya dharanam for tying the two knots. 4.Hey Agni, please give me a wife who is very attractive and with long life. 5.Hey Agni , bless us to cross like water all problems in our life . prayer as of the first time. of popped rice for the third time. being given to the tree. you in the world of Brahma. blessed go and be with me without the fear of the rope of Varuna. performed as a prayer on similar occasions. called Vyahrithi homa, Swishtakrith homa and Prajapathi homa follow these. Akshathai thrown at them and collected from the groom’s Uttariya on their heads. are only asked to do one namaskaram. their relatives and friends. The first to give presents are always the bride’s parents. This always includes a silk sari from the bride’s parents and a Veshti for the groom. aunts. Only Thamboola is given back to the maternal uncles. now given in some marriages only to the near and dear of the groom. the groom’s party and the husband’s relatives give Palum pazhamum there. their inhibitions and make them realize that they have some very special rights. husband to the wife but he would be sitting down. Once this is over the husband takes a coconut and gently rolls it towards his wife. to pry it using one hand. The relatives tease them a lot. arranged instead of the Thozhi pongal. ceremonies to a single day, this ritual disappeared. several prayers to be recited by the groom during this occasion. be able to hold this cart safely. stars and sun shine in the sky. bull, so that we complete our journey safely. law , sister in laws and brother in laws. brings from her house, should not succeed. have my servants to help me. Let Aswini devas make the water available on my way healthy and of good quality. Let them give me ten sons and wealth. There are similar prayers to cross a burial ground, forests and rivers. brought by you and which has been kept in this hose without hatred and with peace. rice over which the ghee flows. After this the couple perform the Pravesa Homa. increase our wealth and give us children. do not die before us. not depend on anybody else for sustenance. interested in looking after you both. me and live up to 100 years. him give us both different types of wealth and give us long life. 9-13 These are same as the last four prayers of the pradhana homam. wealth which never diminishes is made and the homa comes to an end. Vasu .He is made to enter a decorated stick and Pooja is performed to this stick. By moon, the crops have grown and because of that the gods have benefited. stars, this child has been kept on your lap. maid also should become fertile. several children. You are the queen of this house. Hold this post in a just manner. help me perform all religious sacrifices. bless her to live with her husband till ripe old age..
41.Showing of Dhruva and Arundhathi. silence till night when the stars come at night. stars are tied to you. Kindly protect me from my enemies. let my wife become the eighth one. husband Betel leaf and Areca nut to chew. This is called Thamboola Charvanam,. be attracted by any other males. There are other general prayers to the Agni. Viswa Devas makes our hearts closer. Let The God of water make us close together. the one at the brides house , used to take place in earlier days. room. The Sumangalis spread a mat on the bed in the nuptial chamber. bride understand the facts of life. should worship gods daily and get good children. Thus comes to an end the iyer marriage ritual. Appendix 1. Some special songs sung during marriage ceremony. several songs on different occasions , while the marriage rituals are performed . Unfortunately many of these songs are no more available or known to our elders. Atchudanada Moorthiye- Pachai Kavacham Podave. To all my worries, Hey Ramachandra. And all kept different beats. And thus our darling Meenakshi caught hold of his mind. With all the happiness in the world. Prana Saga Pol Ennai Anaithu alum. These words told by me, your wife, darling. To do all your work , my darling. You should take them as proper love, my darling. And embrace and pardon all the mistakes, I do. Mohiniyai Kandu Bhogikka Asai kondu. Nan enna thavam cheytheno, enakku Vache. Why should you look so worn. Tell all the reasons for this first. And got insulted by Hari, Oh darling mine. Is full of water darling mine. They will abuse me, darling mine. To get an husband like you , darling mine. Kalyana Guna Seela Vadani Varai. You are lotus faced, Oh my darling. Ere you came to light , this world, oh darling. You are a golden tendril, oh darling. You are the sweetest of honey, oh darling. You are a pleasant faced one, oh darling. Sathiyamai Cholgiren , idai kelai. Kopam Kollamal ennai Koodadi En thene. Please hear this, oh darling mine. Hold me with you darling mine. Q: What are the prohibited degrees in a Hindu marriage? Q: What ceremonies should be observed to solemnize a Hindu Marriage? rites, the invocation before the sacred fire and the sapthapadi are essential ceremonies. essential part of a Hindu Marriage? not be performed. Otherwise 'sapthapadi' remains an essential ceremony in a Hindu marriage. 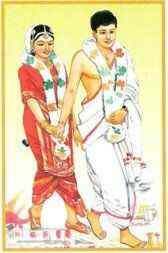 Q: Would a marriage be valid on the observance only of sapthapadi? 1.Preliminary Discussion with the Bridegrooms parents. b. Dowry, ornaments, vessels and other items expected by the grooms family. d.Ring size of the groom . e.Slipper size of the groom. g. Approximate number of guests accompanying the groom. necessary to arrange a separate Vadhyar for them locally. j.Request them to inform their travel plan sufficiently early. posted by the bride’s father. whether they require it in a CD. 2.Fixing up of a hall. and if not the number of common bath rooms),Personally inspect how neat they are. Also find out whether hot water facility for bath is available. d.Whether they will provide the vessels and stow with the hall free? e.Whether there is a generator in the hall? f.Whether there is provision for extra decoration with them? g. Whether they have a swing for the Oonchal ceremony? h.Whether they have Homa Kunda for performing homa. i.The number of servants who are available with the hall and their remuneration. j.The number of cars that can be parked inside the compound. parts of the town. Make a list of bus numbers passing near by. the traditional necessities of the marriages during the marriage including flowers. reception also should be told to him. the requirements for the bride’s family. specification of the filling like cashew nut, boondhi, paruppu thengai etc. 4.Fixing the priest to conduct the marriage. them , the same priest could be told about that also. this is necessary , arrangements should be made for that also. should be contacted and fixed before printing the invitation. wear during Kasi Yatrai.One more extra set of Veshti has to be presented to him . held fan, a holy book and slippers. make one such kodi, with a provision for putting the thalis in that. a gold chain to him during the Nischayathartham. It is also necessary to have a pair of Pudupanam for the Dharma Virtual function. If not available two small gold coins of the least weight possible can be got made. would avoid lot of problem when this ceremony is going on. during the marriage. If this is decided upon , then it is necessary to get them made. only are to be given, these are readily available. in tamil has to be sent. senior elders of the family. stay near the place of the groom they can do it on behalf of the bride’s parents. parents, they also should be invited personally with coconut, thamboola and flowers. It is necessary to get a professional who has covered iyer marriages before. can be followed up by a telephone conversations. 15.Purchase of presents to near relatives and honoured guests. based on our capacity to spend. Uttariyam.The requirement should be estimated and sufficient quantity purchased. 16.Contacting the Grooms party and finding out their travel plans. the sumangalis and one Pavadai is presented to a the girl invitee. circles, arrangements for this also needs to be made. 19.Two days before the marriage. of toothbrush, toothpaste, Shaving set, mirror, toilet powder, hair oil and comb. palikai, oonchal, arathi etc to the different female relatives. received with Thirattu pal, thamboolam, coconut etc along with mangala vadhyam. have to be provided transport. taken to her place in time. for Vritham to the groom reaches them before they retire. 21.The day of the marriage. nominate 2 members from her side who will participate in the paligai from her side. function to her friends and relatives. the groom’s party handed over to their representative in time. number of guests come, the material cooked would not be sufficient. stand or railway station as and when they want it. give them food packets for the way. The marriage contractor normally supplies this. It is a custom to supply Kattu Chadam to the departing guests of the groom’s party. meals. The wishes of the groom’s party should be ascertained regarding this. A few of the people accompanying the groom normally stay over to the next day. Kattuchadam and also provide them transport. train) should be done well in advance. the couple. Again early arrangements for journey and stay has to be made . If everybody follows this it will set a standard. Thanks for this wonderful compilation. Thank you very much for excellent guidelines. Very helpful to those who have migrated to other countries. I will pass it on to other Iyers here in USA. thank you for the detailed guidelines. Every one knows Edges of Marriage hall. But no body will see the top my sister in law marriage function one of the boom lift rental for camera shoot. The groom prays that everything evil from the bride be removed before marriage - no such prayer for the bride, asking for groom's sins be removed? in some family toe ring for bride is worn by bride's mami as oonjal seer (oonjal pudavai, metti, neli mothiram, kolusu) given by mama. A typical Tamil wedding seems nothing less than a royal affair when you walk in. Adorned with the hues of saffron, gold, and red, the venue reflects the true essence of the Tamil culture and the rituals withhold the sanctity of the ancient Vedas and their verdicts. Really Very good compilation of Rules and Rituals of Tamil marriage community. Thanks for Writing such content. Is there much difference between iyer and iyengar style of marriage ?